Hi. These 'Team' bikes from Viscount in 1981/82 were in the middle of the Viscount range, below the 'Aerospace' bikes but a cut above some that had frames produced in Taiwan. I don't know what steel was used for the Team bikes, but you probably feel that it isn't too heavy. It doesn't feel like gas pipe, but I don't think it is the same chro-moly steel used in the top of the range Viscounts. The flat rear drop outs (rather than cast/forged) and the lack of a derailleur hanger also indicate that it's mid-range. Did it have alloy rimmed wheels? Viscount mixed and matched their components, depending on what had just arrived at goods in (it seems like that anyway), so it's hard to be certain what components any particular model should have. These frames are good for many sorts of bike from commuter to light tourer to road training and can be fitted with original, better quality or modern components according to taste. What do you p;an for your project? You'll get connected to the old CTC crowd over at the new forum with lots of info. I was wondering if somebody knows if these forks look original to an Aerospace frame? I bought the frame and parts on recent but different ebay auctions. Actually I'm looking for a set of the aluminium forks, that would suit my viscount project better. Any help available with that? If this message is in the wrong place, sorry about that. Is there a place for viscount dicussions elsewhere on this forum? Cusqueno wrote: Hi. These 'Team' bikes from Viscount in 1981/82 were in the middle of the Viscount range, below the 'Aerospace' bikes but a cut above some that had frames produced in Taiwan. I don't know what steel was used for the Team bikes, but you probably feel that it isn't too heavy. It doesn't feel like gas pipe, but I don't think it is the same chro-moly steel used in the top of the range Viscounts. The flat rear drop outs (rather than cast/forged) and the lack of a derailleur hanger also indicate that it's mid-range. Did it have alloy rimmed wheels? Viscount mixed and matched their components, depending on what had just arrived at goods in (it seems like that anyway), so it's hard to be certain what components any particular model should have. These frames are good for many sorts of bike from commuter to light tourer to road training and can be fitted with original, better quality or modern components according to taste. What do you plan for your project? The plan is to get it usable and ride it really at the moment. It has got all Shimano gear on it currently including suicide levers friction downtube shifters. I would like the clean that all up next build it it all up to a good usable stage new bearings etc and then use it! I think I have around 12 frames at different stages of build. Nothing that is all too rare I have some Raleigh, BSA, Elswick, Dawes, Peugeot and a bonded Vitus 979. 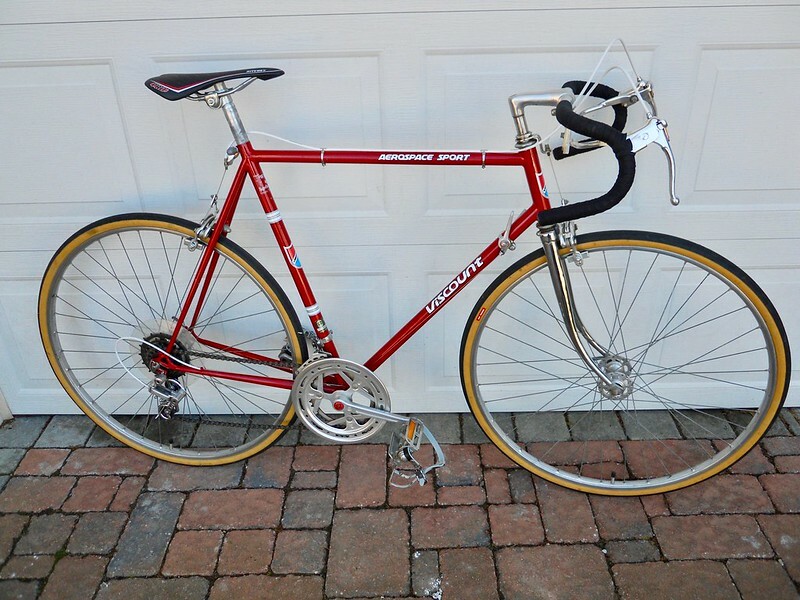 If I remember rightly it has rigida rims on it I haven't looked at them too much so far concentrated on the frame really first. ...is there ever such a thing as too many bikes? I am rebuilding my Viscount which I bought in Lymington,Hampshire, UK, in 1975. I have stripped it down. First time to replace BB, rear and front wheel, and headset bearings, so it hasnt done many miles but needs a heart transplant! The BB transplant went very well thanks to internet directives. I have given the rear wheel assembly to my local bike shop to replace the sealed bearings. I have rubbed the frame down prior to repainting. Now wondering if I can locate a set of decals? What are the painting options (in NE England). I am grateful for any help you may offer. Hi, Thought I'd help you along with some info for your rebuild. You've got yourself the Aerospace Sport model. It came in two colors, blue or red, with the Shimano Tourney GS and a full chrome fork. Also has the sealed bearings bottom bracket and sealed wheel bearing as you described. No problem sourcing decals. Just check ebay. They've got what you need listed under Viscount Aerospace. Sounds very original. Always nice if the paint is in good shape to keep it as is. We've migrated a lot of the current action and info over to www.viscountandlambert.boards.net. You'll find tons of great info and pics here as well. If you get it together by early summer, you won't want to miss the annual Death Fork gathering of the faithful thats be planned at the new site. Post some pics! Here's my recently acquired Aerospace Sport with original paint and new stickers from ebay. Then after a strip down on a sunny morning. Unfortunately I found several bodges attached to the frame including some garden hose to make a rear light fit haha! Is there ever such a thing as too many bikes? Thanks Mike, most useful. Unfortunately my Sport was stored in a friend's barn for a number of years and rust is evident on frame, forks, stem and pedals. I need some guidance on what is best to do without spending oooodles of dosh. I have signed up to your link, thanks. Your Sport is beautiful. Well done! viscountamble wrote: Now wondering if I can locate a set of decals? I have Viscount 'HF' hubs. I took the rear hub to the LBS to have the bearings replaced. It has come back very rough indeed and they suggested that I ride it hard for a month! They say the hoyed the old bearings. So I am taking it apart but cannot find a freewheeling splined hub tool which fits. Would someone kindly lend me the tool or point me in the right direction, please? I note that the front bearings are 6000-628RS and the LBS has inserted 6000RS. I think the problem is with the bearing on the freewheeling side. Anyway which are the best bearings to insert? What freewheel? Can we have a picture and, if possible, the text of any writing on the freewheel?